Rocking vertigo means that one has a sensation of movement such as on a boat. Practically, there may be a sensation of periodic rotation, or a sensation of sway. The rocking sensation is rarely accompanied by true vertigo (i.e. spinning). Sometimes these patients are called "rockers". Little is know about the cause of rocking sensation. 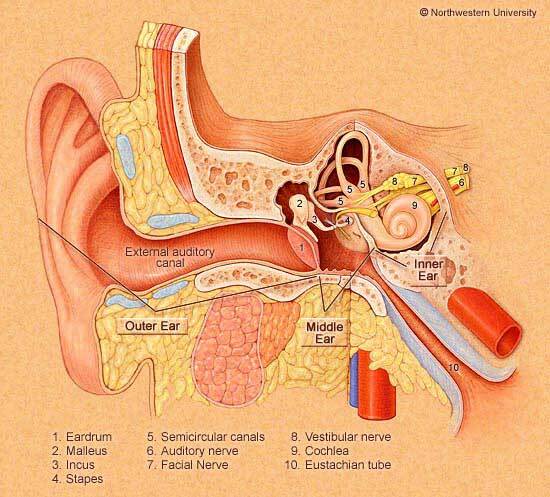 In theory, it might be due to disturbance in the vertical semicircular canals of the inner ear (see figure above), due to a disturbance in the sensors for linear acceleration, the otoliths, or a disturbance in the central connections of these structures. As presently our ability to test these structures is very limited, it is difficult to be sure. In this regard, considerable recent progress have been made in assessing the otoliths (VEMP testing). Rocking can rarely be a consequence of certain medications such as minocycline (Claussen, Schneider et al. 1987). Rocking is common in a variant of motion sickness called "Mal de Debarquement syndrome". These patients generally developed rocking after a long boat ride, and improve when they drive. A similar group of individuals in age and gender (females in mid-40's), but without motion exposure, are rare but definate occasional visitors to the dizzy clinic. About half of these patients have autoantibodies to their thyroid. Some physicians consider "rocking" vertigo to be a "psychogenic" type of dizziness. (Afzelius, Henriksson et al. 1980). To us, we think it would be more accurate to say that these physicians did not identify the cause. The author of this page has encountered occasional patients who developed rocking after a brain lesion. Of course, brain lesions are sources of stress, and it is possible that these people are another example of a psychogenic dizziness. To sort this out, one would need to determine whether certain types of brain lesions are associated with rocking to a greater extent than others. The author of this page has also encountered occasional patients with rocking accompanying a primary visual disturbance (strabismus). Here, it would seem likely that it is variant of motion sickness. Rocking, like most types of dizziness, is usually worse when individuals are under stress. 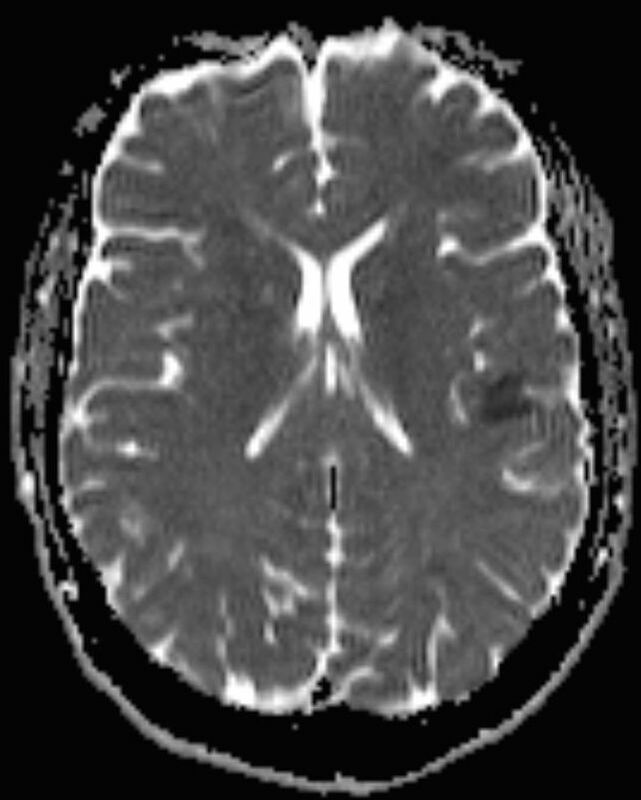 Diffusion image showing low blood flow in parietal operculum, associated with rocking symptom. Persons with rocking should be examined by a physician with expertise in inner ear disorders as well as neurological disorders. An example is the practice associated with the author of this page (Chicago Dizziness and Hearing). Most very large cities in the US have a medical practice of this type. Additional testing may be suitable for individuals in which Meniere's disease is a strong possibility. Treatment is usually symptomatic. Benzodiazepines, such as klonopin usually are very effective, but of course are also addictive. SSRI (such as paroxitine) or SNRI type antidepressants (such as venlafaxine) are also often worth considering, in very low doses. Vestibular rehabilitation therapy should also be tried. Afzelius, L. E., N. G. Henriksson, et al. (1980). "Vertigo and dizziness of functional origin." Laryngoscope 90(4): 649-56. Claussen, C. F., D. Schneider, et al. (1987). "[Equilibriometric measurements of central vestibular dysregulation following administration of minocycline]." Arzneimittelforschung 37(8): 950-3. Henriksson, N. G., L. E. Afzelius, et al. (1976). "Vertigo and rocking sensation. A clinical analysis." ORL J Otorhinolaryngol Relat Spec 38(4): 206-17.